We’re excited to be sharing some changes we’ve recently pushed for our Website Backups product. 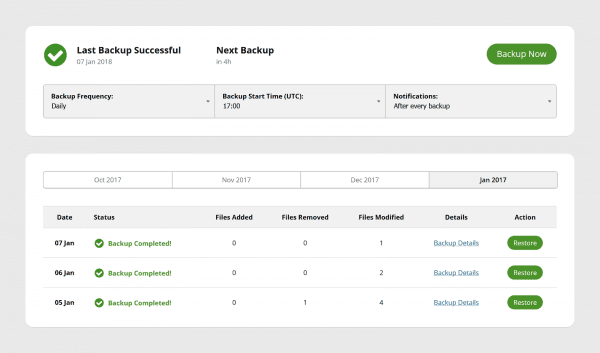 If you’re not familiar with this feature, Sucuri Website Backups allow you to completely backup your files and database in our secure infrastructure. In a worst-case scenario, where files or databases are overwritten or deleted, these backups make it easy to restore your website to its previous condition. By backing up your website, you ensure that you’re covered in the event of a critical failure. In the past, restoring a backup required several steps – users needed to restore their database using phpMyAdmin, download the zipped backup files, unzip and merge them on the host server. While these instructions are still valid, our latest product update includes a One-Click Auto Restore feature that makes restoring backups a quicker and much more simple task. Once a website has been configured and an initial backup has been created, customers can easily restore their website in just a few clicks from the Sucuri Backups Dashboard. We’ve also updated the Calendar View to simplify Backup management. This new view makes it easier to schedule backups, review your backup frequency, and update notification options. 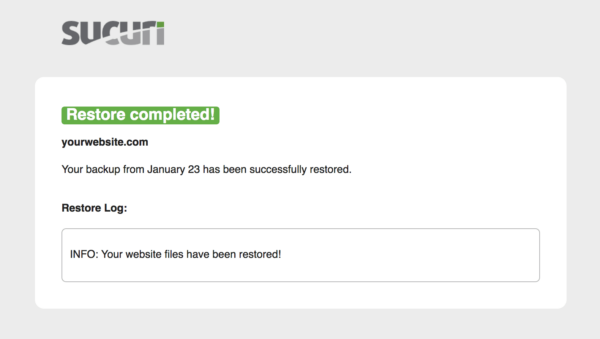 The new One Click Auto-Restore functionality includes the option to restore both backed up files and databases. Backup restoration is very easy – simply select the specific version of files or database you want to restore and the service will overwrite the existing content on your website with the specified backup. We’ll notify you by email as soon as the restoration has completed. As an important pillar of website security, we wanted to make website backups an easier, more user friendly experience and we hope you enjoy this new update. If you have any questions or feedback about the Backups product or simply want a hand setting it up, we’d love to hear from you!